Obesity and piriformis pain are certainly related factors in many patients. Obesity increases pressure on the piriformis muscle and can cause or aggravate pain, especially when standing walking or performing any weight-bearing physical activity with the legs. Doctors now rate obesity as the single greatest risk factor to good health. Obesity is cited as being the most dangerous lifestyle choice a person can make, facilitating premature death due to a staggering array of possible processes caused by being morbidly overweight. From an economic point of view, obesity is also the largest burden placed on society in modern times, increasing the cost of taxes, social programs, insurance and healthcare exponentially. Obesity is one of the top problems facing modern humankind and shows no sign of getting better. In fact, the rate of obesity continues to rise as more and more people become dramatically disproportionate in height and weight. This discussion focuses on the relationship between being overweight and suffering from piriformis pain. We will detail why obesity can cause or contribute to piriformis pain and why patients who are overweight should prioritize losing weight in order to save their very lives. More mass in the body will always translate into more stress bearing down on every anatomical tissue. When the body is conditioned and strong, more mass will build it to greater degrees of strength, such as in the case of large, athletic individuals like bodybuilders. However, obese people are not in shape and their inordinate and asymmetrical mass is a hefty burden for their bodies to handle. The results are accelerated degeneration, chronic strain and general stress on all the tissues of the anatomy. The piriformis muscle is located in an area that is particularly susceptible to obesity-related stress. It is beneath the center of gravity and located in a weight bearing part of the anatomy that is concerned with motion of the leg and hip. It is well known that the lumbar spine, sacroiliac, hip joint and all the connective and muscular tissues contained therein suffer some of the worst effects of obesity, since these structures must hold and manage all that moving weight on a continual basis. No matter what the nature of the piriformis pain diagnosis, being overweight will exacerbate it. Obesity will also increase the healing time for injuries, increase the chances for disability from any health crisis and exponentially increase the chances of developing chronic pain at some point in life. In cases of piriformis injury, obesity alone is enough to directly cause RSI disorders in the muscle or acute trauma from normal movement under the great duress of the added weight. If injury exists from an unrelated reason, obesity will slow its ability to resolve organically and will potentially cause further trauma just due to the downward force of such burdensome mass on a compromised musculature. Obesity is a proven cause of muscular imbalances, especially in sedentary people. Obesity can place unbalanced loads on antagonistic pairings of muscles, causing one to become incredibly tight and the other to become excessively lax. These functional issues are common instigators of piriformis pain and piriformis syndrome. Obesity greatly increases the chance of suffering symptomatic compressive neuropathies in the lumbar spine, which can create innervation problems in the piriformis muscle and subsequent pain or constriction of the sciatic nerve if the piriformis goes into spasm. Finally, obese people are perfect targets for mindbody pain syndromes and we have seen many who were suffering not only the collateral effects of their size physically, but psychoemotionally, as well. Regional ischemia is a common finding in piriformis syndrome diagnosis in overweight individuals. 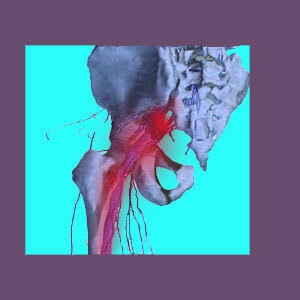 During the course of this website, we are laser-focused on piriformis pain conditions. However, this does not stop us from propagating our larger and more important message to all of our readers: We are trying to improve the collective health of humankind and do so by reaching out to each individual reader, one at a time. This has been our mission for many years now and will continue until we feel that our job has been accomplished. Statistics are not promising however, as obesity continues to grow to ever more threatening percentages within the general population. We can tell you for sure that being obese places you at the very greatest risk to your health. Obesity is rated as much worse than smoking, drinking alcohol excessively, taking illicit drugs, and suffering from suicidal depression or any other singular life factor that may lead to an early demise. Obesity and the direct complications of obesity kill more people prematurely than cancer. We understand that losing weight and getting in shape can be daunting propositions, but they are necessary objectives if you want to live. If not for yourself, then please try to lose weight and improve your health for those who love and depend on you. There are numerous resources that can help you to tone up, get well and become fit. You do not have to spend a lot of money, but you must be resolute in your desire to change. We have confidence in you and hope that you will initiate changes that will save your life and relieve your pain!